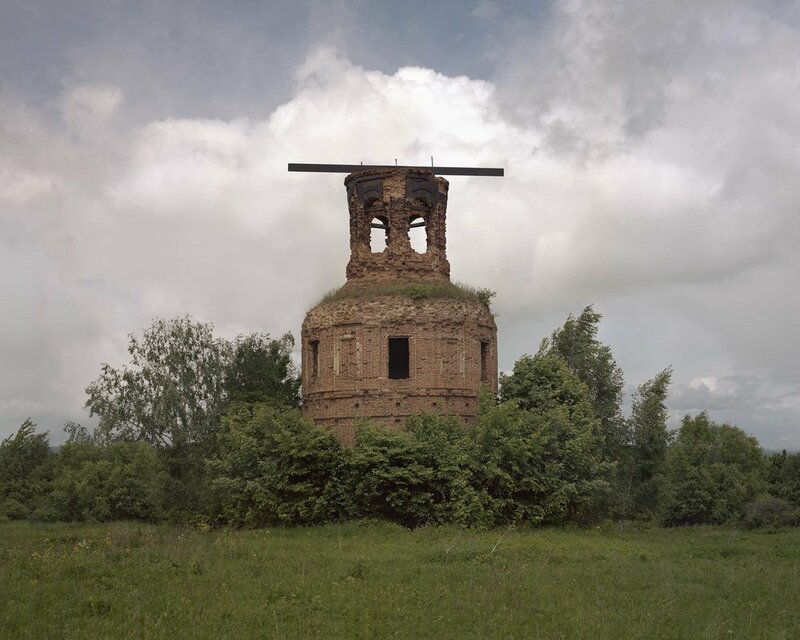 Danila Tkachenko, who lives and works in Moscow, Russia, is a visual artist specialising in photography. He graduated from the Rodchenko School of Photography and Multimedia in Moscow. He is a winner of the 2014 World Press Photo Contest, for which he was awarded first prize in the Portraits category for the series Escape. BOTB Thank you for talking to us about your work. Your recent series Monuments really struck a chord with us. 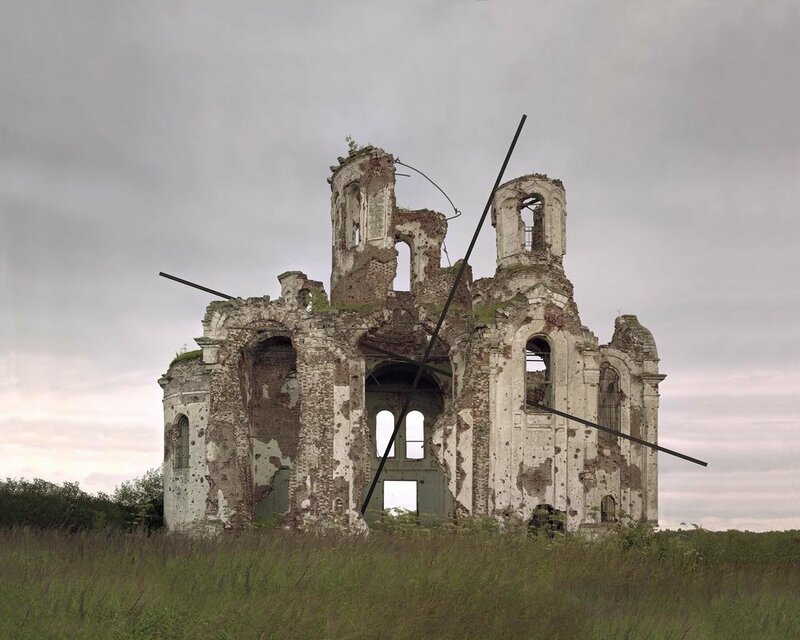 The interventions seem to be both acts of construction and acts of erasure and the resulting photographs seem to both obscure and reveal the qualities of the host buildings, these incredible ruined churches in the Russian countryside. The images seem to ‘rescue' the buildings; the additions perhaps finishing or completing them. On the one hand the spatial qualities of the host buildings are amplified through the additions you’ve made; your documenting photographs make them more than just obsolete structures, more than just maudlin or nostalgic objects. They have weight, volume and mass. They have air inside them, they still reach heavenwards; even in their ruined state you can still see their architectural, even Platonic, qualities. 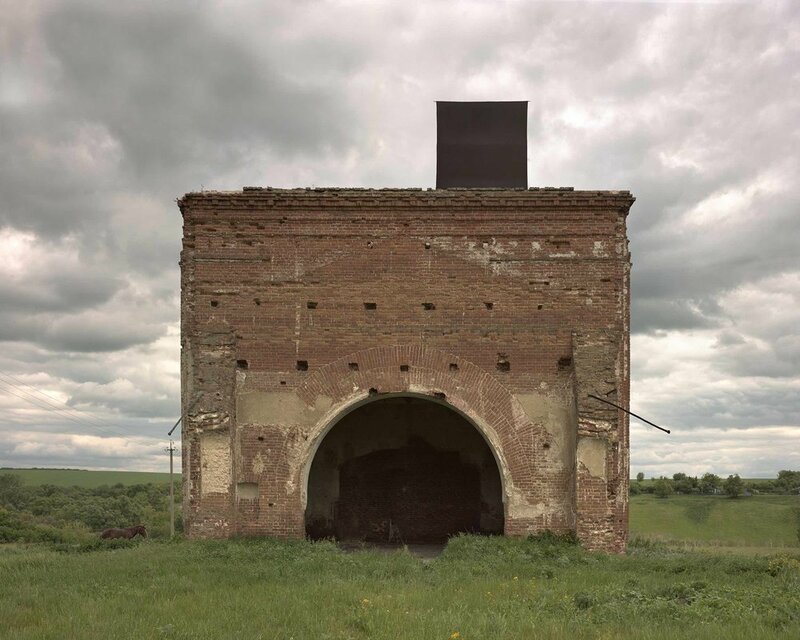 Additionally, the historical context of the abandonment of the churches in 1917 is made very palpable; the formal characteristics of the interventions bring to mind the work of Vladimir Tatlin, Alexander Rodchenko and the dynamism of the Constructivisits. 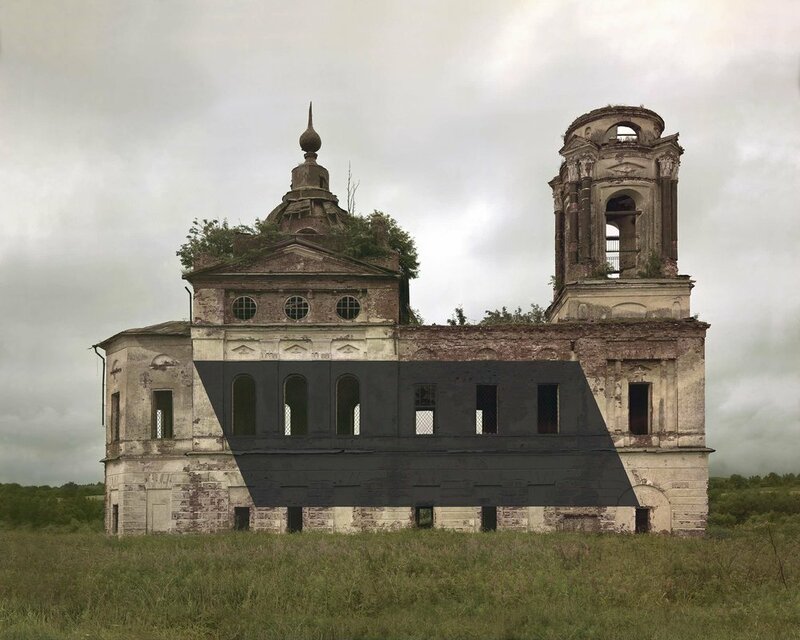 Yet, at the same time, the monochromatic interventions also seem to take something away from the ruined buildings; the photographs feel almost like redacted, or censored images. Did your choices of what interventions to make arise from your survey of each structure or did you have methods in mind from the beginning? DT Initially, I didn't have the work plan except for the production of the gesture itself. I traveled around Russia, a journey of about 7000 km, to explore the destroyed churches and, for this project, I hired an engineer who traveled with me. We visited 46 abandoned churches altogether and at each spot I came up with ideas for their "modernisation". In turn the engineer suggested to me how these ideas could be achieved or whether they were even possible. Then we bought the necessary materials and started the "modernization". BOTB The interventions were very ‘light-touch’ and were removed after photographing them. The Monuments series is almost like an inventory of the different ways you could alter a building; you can add something to the top, hang something from it, wrap it, pierce it, fill it with something, balance something on top of it, etc. 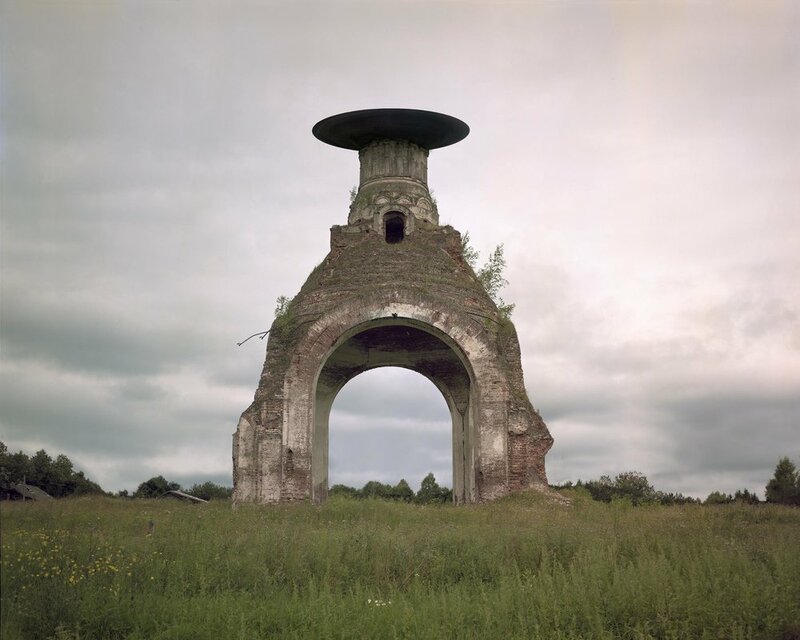 Both Monuments and your earlier series Motherland seem to point at an increasing interest in working with buildings and I wondered if you could see architecture becoming more central to your practice? DT I am interested in the intersection of landscape and politics since the landscape has a great cultural influence on the person and their self-awareness in it. Russia is a country with huge abandoned and uninhabited territories which were arisen as a result of state policy. I see this landscape as an unmarked graveyard of the social utopias and I believe that this cemetery is not fully apprehended. As a result the "living dead" wake up in it, in the ideological sense. I am interested in working with this phenomenon, rethinking it with the help of art, using the practice of photography, land art and interventions.